No matter if you are young or old, it is likely that many of us find the act of jumping on a trampoline not only physically challenging but downright enjoyable. Being shot up vertically by the trampoline’s springs gives a feeling of freedom that can take one back to their childhood. The best part about trampolines, in particular mini trampolines, is that not only do you get to do a fun activity they also offer a great way to get in a quality workout without overloading the joints. While the workouts on a rebounder trampoline can range from low key to downright tough, mini trampolines also have shown possible benefits that you don’t get from other exercises. One of the most talked about benefits is that doing rebounder exercises will flush out your lymphatic system. Many claim that by rebounding regularly, fluid in the lymph nodes is flushed which moves out toxins and other waste that lead to many common illnesses. This is based on the theory that the G-force caused by jumping will lead to the lymph fluid moving, thus not becoming stagnant in the body. A study from NASA in 1980 did show that working out on a mini trampoline is more physically taxing than jogging! So, don’t let anyone tell you that doing a rebounder exercise routine is easy. Lastly, doing rebounding exercises regularly helps with balance, which can be important for seniors who have a history of falling. 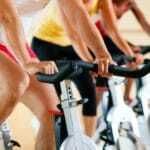 At ListofFit, we look at the mini trampoline and corresponding rebounder exercise routines as a good alternative to other aerobic exercises. This can be a good option to supplement a running regimen as a way to cross-train so that you do not become susceptible to overuse injuries that can occur when doing a specific exercise repeatedly. 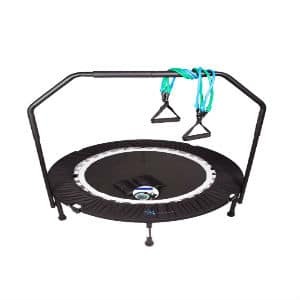 Not only in this article have we included our top five picks for the best mini trampoline, but we also have discovered some great rebounder workout videos that you can do in the comfort of your own home. So, once you pick out your trampoline be sure to scroll down to the bottom of this article for some great free mini trampoline workouts. Pro: Our best mini trampoline pick. Jumpsport makes great trampolines that are designed to last. The 250 features arched support legs and Endurolast 2 cords. Con: High price will make it unaffordable for some. Pros: One of the least expensive bungee powered rebounders that money can buy. Con: 36 inch diameter is a bit smaller than other options. Larger users may want to consider a larger rebounder. 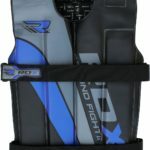 Pros: A premium quality rebounder that will last a long time with regular use. Has highest trampoline weight limit of 300 pounds. Con: Uses heavy duty springs that are quality, but do create greater noise levels than bungee cords. Pros: The most affordable option on our list, the Stamina Folding Trampoline is a great choice for beginning rebounders. Con: At this price point you give up on some areas of quality. The springs and jumping mat in particular are noticeably weaker than more expensive options. Pros: A cheaper but comparable option to the Jumpsport 250, the Leaps and Rebounder Trampoline has a 40 inch diameter and high endurance bungee cords. Con: Does not have the arched legs of the Jumpsport 250 making it slightly less stable when in use. When you think of high-end rebounder trampolines Jumpsport should come to mind. They have many different mini trampoline models each with similar quality materials. On the Jumpsport 250 model trampoline they utilize Endurolast 2 elastic cords. These have been tested to last for a million bounces! Having the cords as opposed to the traditional springs also leads to a quieter and smoother rebounding experience. The arched legs of Jumpsport trampolines allow for greater stability during jumping, minimizing the risk of tipping the unit. This Jumpsport 250 rebounder also comes with a padded pedal mat to protect you from landing on the cords. Total diameter of the frame is 39 inches which should meet the needs of most users. Certainly you can find a cheaper exercise trampoline than the Jumpsport 250. Currently, it is priced around the $250 range on Amazon. However, a few factors make this trampoline a better value than what it would appear on the surface. One, this mini trampoline is worth every penny due to its quality and design. This is why the Jumpsport 250 gets raving reviews from users. Two, it comes with some extras including a basic workout DVD that will get you started with rebounding. Honestly, while the other trampolines on this list are good by their own standard, no other entry in this article will match the quality you get from this trampoline. 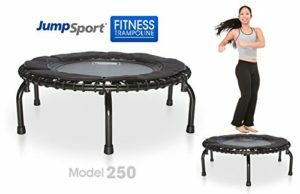 The biggest difference in performance noticed between this Jumpsport 250 and other mini trampolines is the Endurolast 2 cords compared to the typical trampoline springs. The Endurolast cords feel significantly more secure when jumping and do not have any of the loud noises that are associated with springs. 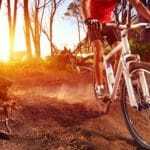 Springs also have a greater chance of causing injury than the Endurolast 2 cords do. Users have also commented about how much more bounce you get from this unit compared to other cheaper rebounders. 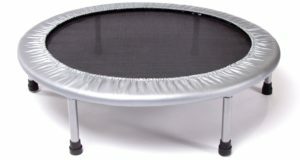 Long-term testing also shows that the Jumpsport 250 Fitness Trampoline lasts over time. 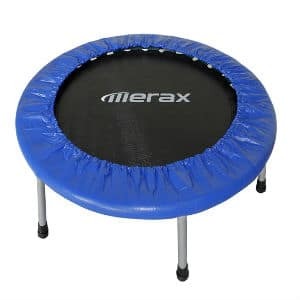 At first glance the Merax Mini Trampoline looks like your run of the mill rebounder trampoline that uses springs as the bouncing mechanism. However, you’d be wrong to think this as the Merax Mini Fitness Trampoline actually uses thick bands that are elastic to create its bounciness. The legs are standard and are positioned right below the edges of the unit. Padding over the elastic bands is pretty typical and similar to other low-cost mini trampolines. At a price point of just under $60 the Merax Fitness Trampoline is a great value for what you get. The elastic bouncy bands are a step up from spring loaded trampolines. This rebounder is also foldable which makes it a nice choice for those who live in apartments or other small spaces. For only a few bucks more you can purchase this trampoline with a stability bar, which may be worth considering if you have balance issues or you have children who will want to use it from time to time. Overall, it will be hard to find another mini trampoline that offers quality components at the price of the Merax. While not up to the standard set by Jumpsport, the Merax Mini Trampoline is a quality rebounder for the price. It has a weight capacity of 220 pounds so that most folks are able to enjoy the rebounding experience. This unit has a 36 inch diameter which will work for the majority, but those who are larger may want to opt for a bigger unit. A few users commented that the springs are not as bouncy as they would like, but we feel that this makes the Merax an even better choice for senior rebounders. As with the Jumpsport 250, the lack of springs on the Merax make it safer to use. Maximus is a mini trampoline company that is out of the United Kingdom. They specialize in top quality spring-loaded rebounder trampolines that use top notch parts. While we in general find band-loaded rebounders superior to spring-loaded, the Maximus Pro does feature the strongest springs we have seen on a mini trampoline. These springs will last due to their jumbo coil design. Not only that but the jumping mat is also impressive as it has double cross stitching that all but eliminates the possibility of someone breaking through the mat. At over $200 the Maximus Pro Folding Mini Trampoline is quite expensive considering its use of springs. Where the Maximus exceeds in value is with all the extras you get with this tramp. Extras for the Maximus include a stability bar to hold on to while jumping, two sets of resistance bands to build strength, and a workout DVD with three separate rebounding routines as well as a core strengthening workout. The extras for this trampoline are great, but the overall of this product is not exceptional. The springs on the Maximus Pro are indeed quality and offer a soft and balanced response under the user’s feet, but they still produce more noise than we would prefer. The actual frame of this trampoline is heavy-duty in comparison to cheaper units, and does allow for folding. This trampoline is also a good size coming in with a diameter of 40 inches and has a weight limit of 300 pounds. Having resistance bands that can be installed directly onto the trampoline allows for users to get a more dynamic workout compared to competitors without these features. Obviously it is hard to compare the Stamina Folding Trampoline to more expensive rebounders in terms of quality. Yet, we must admit that if you are in the market for a cheap mini trampoline then this unit is likely your best bet. There are few bells and whistles with the Stamina, but it does come with elastic bands as opposed to springs. While the bands are not the quality of a Jumpsport trampoline, they will get the job done for most beginners. The design of the Stamina Folding Trampoline is fairly typical as well with vertical support legs and a cover that goes over the elastic bands. Coming in at under $40 the Stamina Folding Trampoline is the lowest cost trampoline on our list. We feel that this rebounder is best for those with limited budgets or just want to give rebounding a try without spending a lot of money. Do not expect anything special with this unit, but also don’t expect it to break in two weeks either. 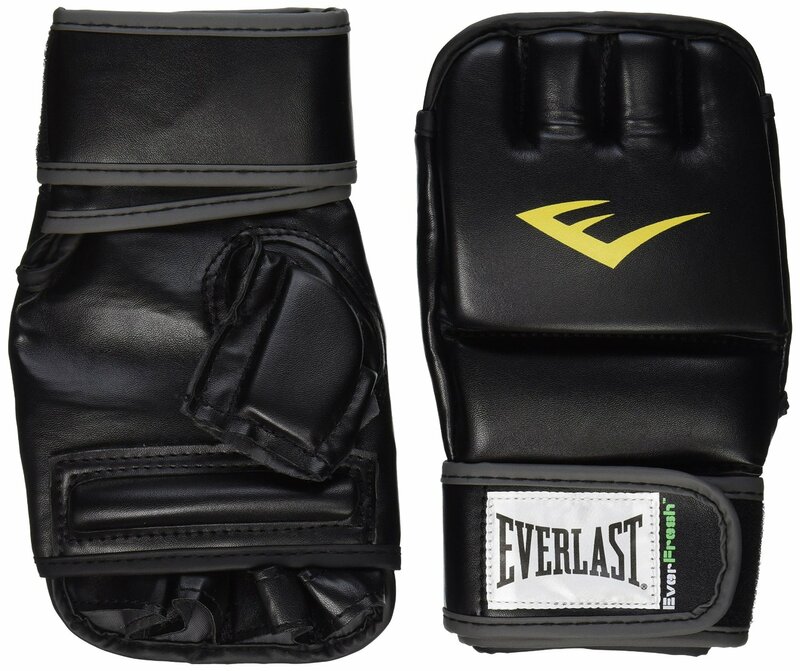 The value created from the Stamina is primarily due to its combination of low cost and decent quality for the money. Most users that we heard from felt that the Stamina had a nice bounce and was not hard on joints. Again, we like the elastic bands which help to keep the overall jumping experience quieter and more enjoyable. 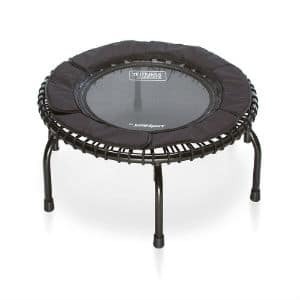 There is no doubt that you will be able to use this mini trampoline to get in good workouts. Weight capacity for this rebounder is also impressive for the price at 250 pounds. However this trampoline is not without weaknesses. It has screw-on legs which mean that they are not folded up with the unit and could become lost. The mat is not the best and may break down after continued use. The Stamina is 36 inches in diameter which is smaller than most of the other choices on this list. So, if you want a larger jumping area you may want to consider other rebounders. Overall, fair/average performance at a great price. The Stamina brand has a great reputation and has ranked highly on different product review articles. You can see where Stamina ranked in some of the other ListofFit articles here and here. 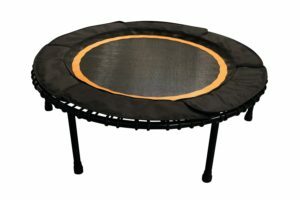 Looks like Jumpsport has gotten some recent competition with the Leaps and Rebounds Rebounder Trampoline. The Leaps and Rebounds Rebounder is a quality mini trampoline that utilizes bungee cords to spring you upward. This unit has a vertical leg design that is seen with most other rebounders. We like the orange ring around the jumping area, which helps rebounders see where to land using only peripheral vision. A pedal cover protects users from injuring their feet or ankles on the bungee cords. While the Leaps and Rebounds is a higher-priced rebounder trampoline coming in at around $160, it is still a good value due to the focus on quality construction and materials. You will not find any bonus DVDs or add-ons with this product, but we are okay with that given the combination of premium quality and relative affordability. Performance tests of this Leaps and Rebounds Trampoline have been positive. Users have mentioned that the trampoline feels firm and sturdy even for larger people. The 40 inch diameter is also significant as this is one of the larger rebounder trampolines that we reviewed. We do wish that this trampoline would have arched legs as to widen its stance making it even more stable, however, this is a minor issue that will not affect most users. If you want comparable performance to the Jumpsport for about $100 less, then strongly consider picking up this rebounder for your home. We can say with confidence that no matter if you are an experienced jumper or just developing an interest in rebounding, you will find one of our five selections that will meet your needs. With that said the Jumpsport Fitness Trampoline 250 is head and shoulders above the rest. The first reason why Jumpsport 250 is the best rebounder is design. From the Endurolast 2 bungee cords to the arched support legs, the Jumpsport team has left no stone uncovered when creating a great trampoline. Due to the premium Endurolast 2 cord this unit is almost silent while in use. The arched legs offer a wider support base which makes tipping this trampoline while jumping almost impossible. We also failed to mention in our in-depth review that the Jumpsport 250 also has a feature called Flexbounce III which actually allows you to adjust the tension of the Endurolast 2 cords so that you can get a personalized bounce that meets your needs. Also recognize that Jumpsport has more similar quality models as the 250 that are both bigger and smaller so be sure to check out each model as they all have a great reputation. The only downside to this trampoline is that it may too expensive for some. If that’s the case then we do recommend giving a closer look at the comparable Leaps and Rebounds model. The first things we looked for when evaluating a mini trampoline’s materials was if it had springs or bungee cords. Generally speaking (with possible exception of the Maximus) bungee cord units are superior due to their increased safety and noise reduction properties. We also focused on the quality of the jumping mat to see whether it was likely to stand up to the abuse from years of rebounding workouts. Value in terms of a rebounder means comparing the price of the unit to its price, materials, performance, and any add-on bonus items. Just because a rebounder trampoline is cheap does not make it a good value if it is likely to break after a couple weeks. What’s important here is to judge all the factors and come up with an overall score for the trampoline’s value. Most folks will not be happy with their mini trampoline purchase no matter how much they paid if the unit does not perform up to their expectation. Our goal here was to check each trampoline’s bounce, feel, noise level, and stability. If we felt that the unit was likely to tip or break over time then this counted against the product’s performance score. If the trampoline bounced consistently and was made well then it would score higher. In this video Arnita offers a great 15 minute rebounding workout that takes you through several key rebounder moves. This video proves you don’t need to work out for hours to get a great workout with your mini trampoline. The second video is great for those who are just starting out on their rebounder fitness journey. Twenty minutes is a bit longer than our first video but the intensity is less so you won’t feel completely cooked by the end. While the title of this video says that it is a rebounder workout for men, we feel this will work great for anyone who has built up their rebounding skills. If you are not yet comfortable with your fitness level or your trampoline then this video may be a bit too difficult for you at this time.